Do you want more people to know about your products and services? Do you want to reach out to more people? Is paper advertising costly and not bringing in the results you want? Give direct marketing a try and you may get the desired results! First, build your contact list from either your own collection of name cards or from purchased lists. Then, write a message and send it to each contact via email. Alternatively, you could print mailing labels and post the letter to each contact. CARAT Siren handles the management of your contact list easily and efficiently. But wait! CARAT Siren is more than just a data management tool. It is also able to filter out contacts based on the criteria you specify. 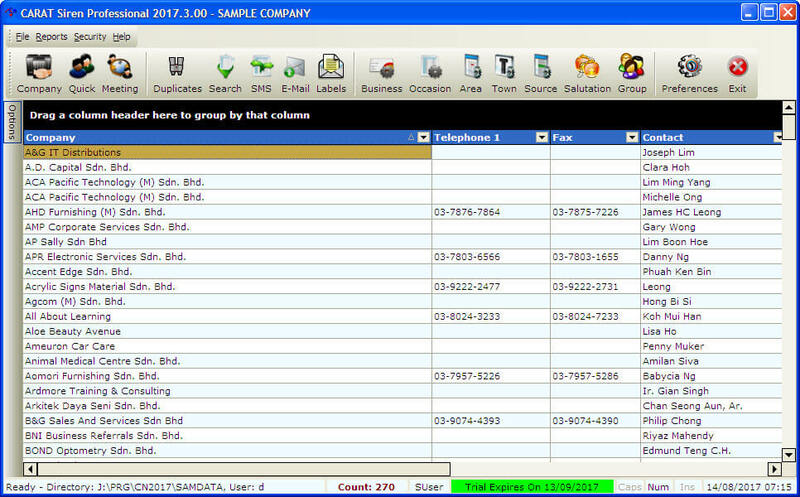 You can pick out contacts by business type, occasion, area, town, source, gender, groups and more. "Machine gun" marketing is not only wasteful but annoying to recipients. With data filtering, you would not send out messages to all contacts when your target is to contacts with handphones that start with 012 or if you try to sell Toyota accessories to owners of Mercedes cars. Contact management is never more easy when using CARAT Siren! Don't hide your valuable contact list and lose out on potential sales and business. Use CARAT Siren to manage them and get new business from first-time buyers and repeat business from existing customers. A trial for CARAT Siren is available here.